A Wedding in December is a novel about marriage and infidelity. A group of seven people in their mid-forties gather together for a wedding. They were all at high school together, apparently an exclusive private institution, Kidd Academy. Bill and Bridget had been a couple back then, but they had split up and married other people. Now they are both single, and Bridget has cancer. They reconnected at the twenty-fifth reunion of their class, and fell in love again. In fact, Bill left his wife and child in order to be with Bridget. The event, on the first weekend in December, is being held at Nora's inn, in the Berkshire Mountains of western Massachusetts. Nora is a widow: she started her new business after her husband, the much older renowned poet Carl Laski killed himself . She describes herself as his "helpmeat," which Harrison, who used to be Nora's boyfriend, finds a puzzling word to describe her marriage. The group is joined by the successful business Jerry, who is arrogant and offensive, with his meek wife, and concert pianist Rob and his partner Josh. The group is rounded out by a writer, Agnes, who is single, childless, and seems very alone. Even during the weekend, she writes her new novel, about a man and his blind wife, and how they came to marry and live in their unhappy union. It is tempting to speculate that Agnes represents Anita Shreve herself, and even if this isn't the case, it is clear that the character of Agnes provides Shreve a way to discuss the creative process and the choices faced by a novelist. Reuniting after twenty-seven years of rarely meeting, these men and women have much to reflect on about how their lives have unfolded and they all have painful secrets. Harrison, living in Toronto with his wife and two children, is the only one of the group with an apparently successful marriage; yet even he wonders what might have been if he had stayed with Nora. Nora holds secrets about her marriage to Carl. Bridget and Bill wish they had had longer together, and worry how much time they will have before she dies. Agnes holds a secret about her sad love life that she wants to tell her old classmates. Jerry is singularly unreflective, but his marriage seems unfulfilling and maybe as a defense, he likes to provoke those around him and tries to prove himself better than his peers. All of them think about their old friend Stephen, a baseball prodigy who died when they were all seniors, but none of them likes to talk about it. Shreve's middle-class heterosexual characters nurse their disappointments about their lives. Each one of them has been unfaithful to a spouse, has been partner to infidelity, or has been cheated on. Only the gay couple Rob and Josh are truly happy together. A Wedding in December is a melancholy novel bordering on the lugubrious. Her pessimism about marriage seems to lead her to suggest that it can only work if the partners are homosexual or if one of them is due to die soon. 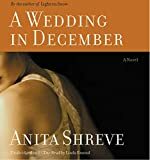 The theme of the difficulty and challenge of marriage is such a well-worn theme that it is hard to take the novel very seriously, especially since Shreve doesn't have new insights to add. The novel derives its momentum from the gradual revelation of various mysteries about people's lives, such as how Steven died and what roles the different people played in his death. This is enough to make the keep the novel interesting, but by the end, the cumulative effect is unsatisfying. Shreve gestures at some grand ideas, but her characters' muted existences are not gripping, and her self-conscious game with the reader of toying with their fates feels tired well before the end of the book. The unabridged audiobook is read by Linda Emond, whose New England accent is perfect for the task. Her slightly constrained reading fits well with the faux-sophisticated tone of the words, and is accented by the inclusion of music performed by a string quartet at the beginning and end of each CD and between chapters.